1. Download your free craft templates and cut your dollhouse furniture with scissors. 2. Decorate your dollhouse rooms with your favourite patterned paper and stick with glue. We used a variety of paper patterns for the different rooms. 3. For extra detail, you can create a skirting board for your rooms by placing ribbon at the bottom of your shoebox and sticking in place with double sided tape. 4. 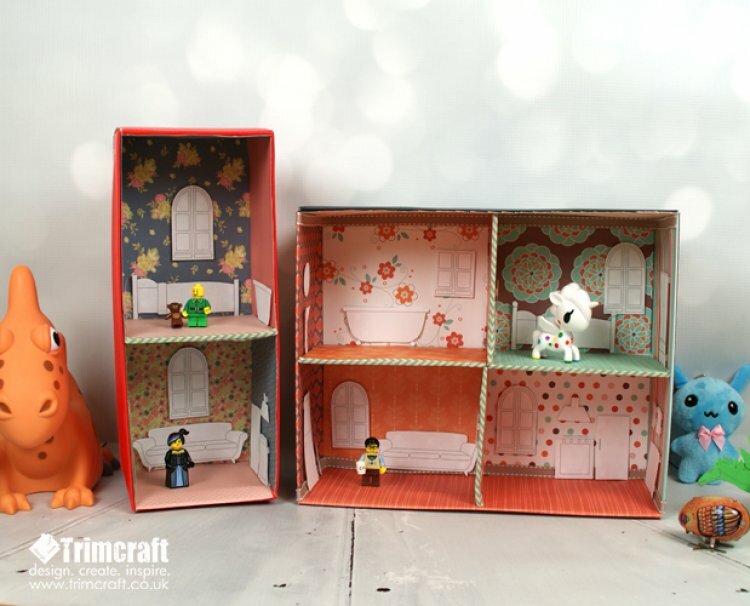 If you have a small shoebox (pictured below) to create your individual rooms, get a piece of thick cardboard the width and depth of your shoebox to create a floor for your dolls house then cover with your selected papers. 6. Use the Washi Tape to cover the edges of your cardboard edges for a pretty finish. 7. Place one piece of Dovecraft Small 3D Foam squares to your paper furniture cut outs and place in your dollhouse, gently press down on your paper furniture to ensure they remain secure. Kids will love the chance to get creative decorating their own house to fill with their favourite toys. Why not show us your recent upcycled crafts in the project gallery; we would love to see them!